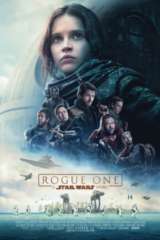 Rogue One: A Star Wars Story offered a unique view of the Force from any other canon material; after all, there were no Jedi in this movie, a first for the big screen series. That allowed a few looks at the Force that haven't beend done before. SPOILERS Ahead for Rogue One. While the only Force wielder in the movie is Darth Vader, the concept of the Force might be more central to this film's plot than any before, and certainly carreid through more individual characters. In previous Star Wars movies, we've heard non-Force wielders like military leaders and even the skeptic Han Solo say, "May the Force Be With You." But we've never gotten to understand what the Force actually means to those who can't use it to throw people across the room, read minds, or pull objects to them. Now, we get two very unique points-of-view on this. The first comes from Lyra Erso, who clearly believes strongly in the Force. While that was more completely addressed in the prequel novel Catalyst, it was touched upon in the film. When Lyra was saying goodbye to her daughter, she gave her a Kyber crystal, the source of lightsaber power - and power for massive weapons like the Death Star. She told her "Trust in the Force," showing how much it mattered to her. That was then passed on to Jyn, who kept the Kyber even if her personal beliefs weren't quite as strong as her mother's. When she comes around to saying "May the Force be with us" and concentrating on what Hope can bring to the Rebellion, it shows her connection to the Force has grown. More obvious, though were Baze Malbus and Chirrut Îmwe, the Guardians of the Whills. Previously, they were among those tasked with guarding the Kyber Temple, a special temple where Kyber crystals of all sizes were stored in the Jedi's holy city of Jedha City on the moon Jedha. When the Empire took over the world, and started removing the Kyber crystals, they were left without a purpose. Chirrut remained dedicated to the Force, even having some level of Force sensitivity. When he uttered his mantra-like prayer, "I am one with the Force, the Force is with me," Chirrut was able to harness his innate connection to the Force. He never, with any level of training, would be able to push things with his mind, but feeling it helped to augment his already substantial abilities in martial arts and his senses compensating for his blindness. He demonstrates that sensitivity in his first appearance, sensing the Kyber around Jyn's neck. Baze, meanwhile, saw their failure to protect the Temple as an indication that the Force was not as strong as they may have thought. He's like anyone who loses faith in their religion, and in the end, he comes back to it when his friend and brother-in-arms dies. This expansion of the Force into even more of a general religion than simply a way to manipulate objects and people is an important step to the future of the Star Wars franchise, and should help with continuing to expand in the Star Wars Story standalone films.